deep kept traffic flowing on Eglinton Avenue by building a temporary bridge deck over the northern half once drilling was completed. It consisted of timber mats supported by steel beams and bracing, and locked in place with steel angle. 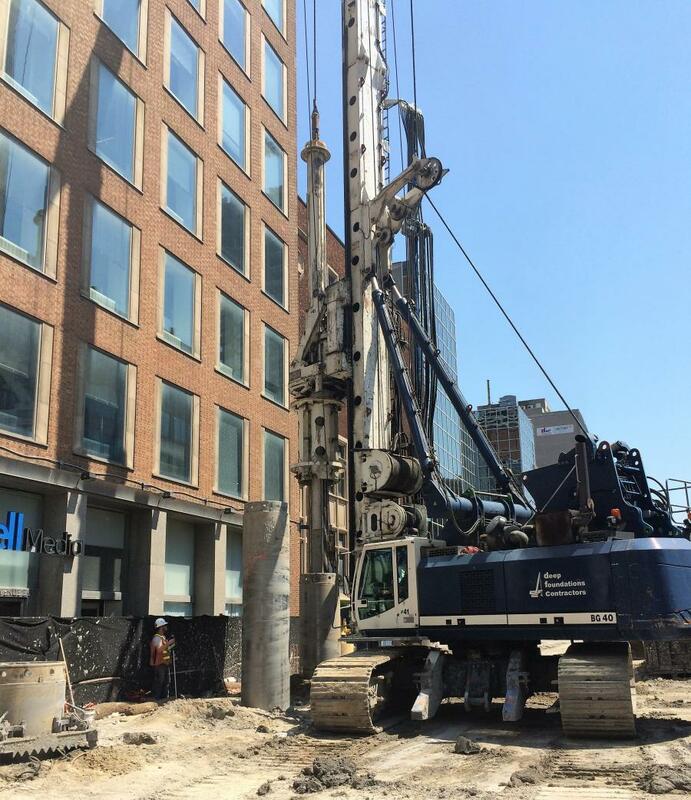 To say that Deep Foundations Contractors (deep) was drilling in a confined space within an extraction shaft on the Eglinton Crosstown Light Rail Transit Project (Crosstown) would be an understatement. It was the first of many challenges the firm would overcome while working above and below the buzzing streets of Midtown Toronto, Canada. 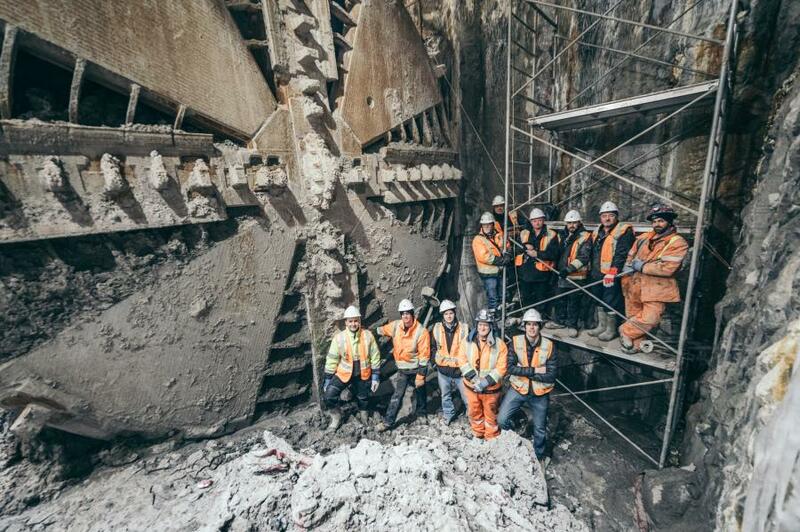 The epicenter of the action, however, was a 32.5 m (107 ft.) deep extraction shaft where two massive tunnel boring machines (TBM) would be lifted from the ground at the end of a long subterranean journey. 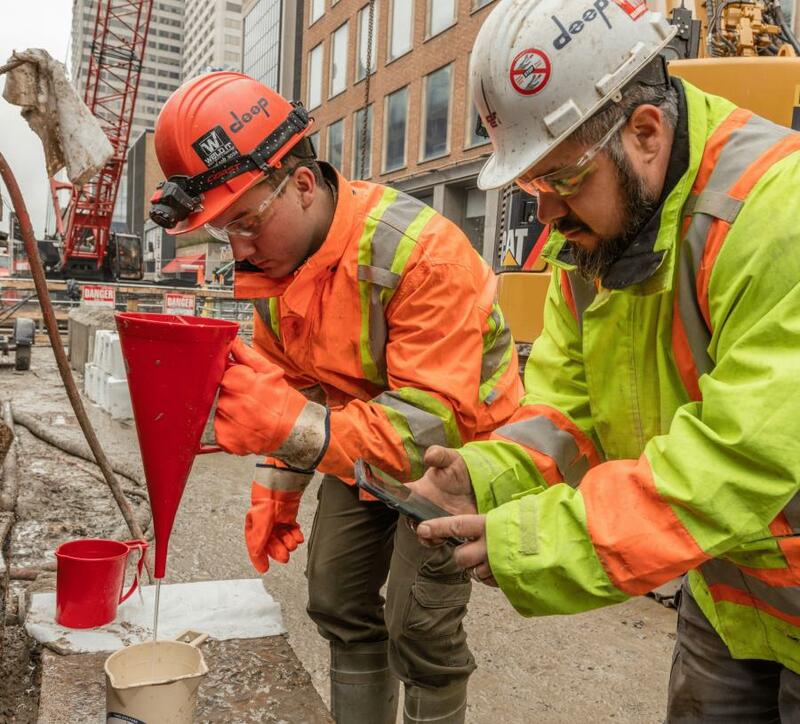 While deep has extensive experience working in Toronto, one of North America's largest cities, there is nothing simple about drilling in a crowded urban environment. The Canadian powerhouse would conquer challenges including inconsistent soil conditions, low clearance drilling, unmovable utilities, maintaining traffic and darkened confined working spaces, in its quest to provide underground access for two rapidly advancing TBMs. Crosstown is a $6.6 billion infrastructure project with a 19 km (11.8-mi.) corridor, 10 km (6.2 mi.) of which are underground. Phase 2 includes the easternmost tunnel. Come 2021, Metrolinx projects that 5,500 passengers per hour will benefit from this project — the largest transit expansion in Toronto history. The Phase 2 contract was awarded to the Aecon/ACS Dragados Joint Venture (JV) in November 2013. Its scope entailed 3.25 km (2.1 mi.) of 6.5 m (21-ft.) diameter twin tunnels; precast concrete tunnel lining segments; launch and retrieval shafts, headwalls associated with future stations, two emergency exit buildings, three cross passages, utility relocations, traffic staging, ground and building settlement monitoring, and site restoration. deep, one of Canada's largest foundation contractors, specializes in shoring for a wide cross-section of building and infrastructure projects. The contractor was a natural fit having worked on large transportation projects, the most recent of which was a subway extension for the Toronto Transit Commission. The Aecon/ACS Dragados JV awarded deep a roughly $16.7-million contract to excavate and shore launch and extraction shafts for two tunnel boring machines (TBM); build two emergency exits for the TBMs; and construct head walls for two future stations. 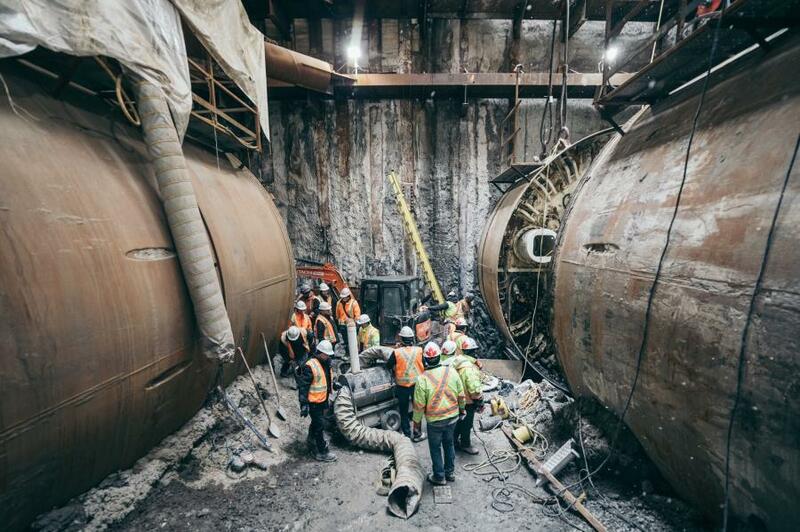 Its work started in April 2014 and concluded in March 2017.
deep's work would allow the two TBMs, known as Don and Humber, to continue their underground journey uninterrupted. The costs associated with stopping their progress would be incredibly prohibitive; failure was not an option. 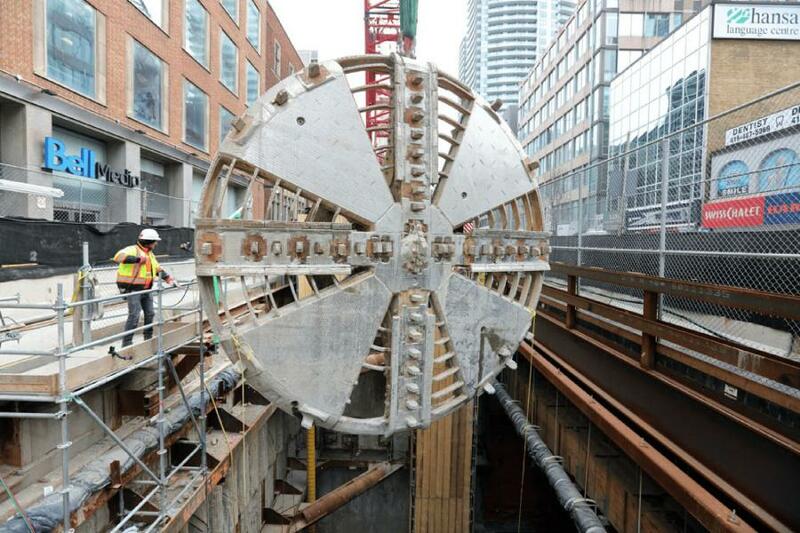 The Caterpillar TBMs — aptly named after two of Toronto's rivers — began tunneling on Sept. 30, 2015. The pair would crawl westbound, digging 3.5 km (2.2 mi.) from the launch shaft at Eglinton and Leslie streets before reaching their destination. 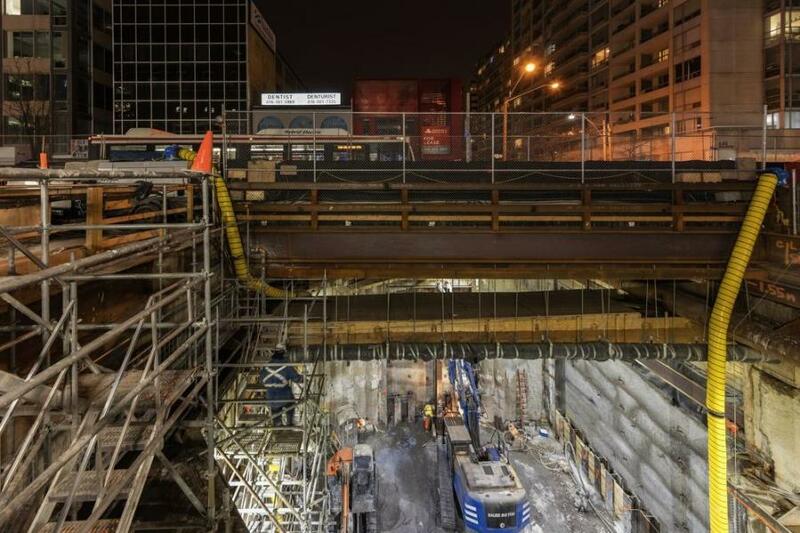 The TBMs would eventually be hoisted out of extraction shaft 3 (ES-3), which sits at Yonge and Eglinton streets, Midtown Toronto's busiest intersection. deep's end goal was to prepare the shaft for their arrival. The ace deep held in its pocket was Canada's largest fleet of BAUER drilling rigs, all of which were acquired from Equipment Corporation of America (ECA). ECA has been a leading supplier of foundation equipment in the eastern United States and eastern Canada for a century. Its fleet runs the gamut from large to small. deep purchased the BG 55 — the most powerful rotary drilling rig on the market at the time with 553 kNm of torque — in September 2016. The contractor then acquired one of the smallest, a BG 11 H, in August 2017. ECA also sold deep seven Klemm drilling rigs. “We have the biggest fleet of BAUERs in Canada,” said Conor Foy deep's supervisor on the Crosstown. According to ECA Canada's Branch Manager Ray Kemppainen, deep geared up by purchasing five more rigs from late 2015 through early 2016, including a BG 46, two BG 39s, a BG 40 and a BG 30. In the early 2000s, deep analyzed the drilling rig manufacturing market and made a calculated decision to acquire BAUER drilling rigs starting in 2003. Analyzing the market was more about the start of a relationship than a purchase. There were no salespeople in shiny suits with glossy brochures; the representatives from ECA and BAUER had real world drilling experience. This relationship between companies is equally about the people and the equipment. Kemppainen recalled the 1970s when the firm was buying foundation equipment from his former employer, Special Construction Machines, known today as ECA Canada. deep is now ECA's largest Canadian client. Kemppainen has surmised after several decades of hands-on service to deep that it handles equipment acquisition like operations: streamlined, uniform and consistent. deep was using conventional crane-mounted drilling equipment combined with vibratory hammers to drive and extract casing in urban environments, which is more disruptive to residents and motorists. BAUER technology allowed contractors to install and remove sectional casings using the powerful hydraulic rotaries of the BAUER drilling rigs. ECA was instrumental in matching equipment to the complexities of the Crosstown, according to Foy. The back and forth Foy refers to revolves around service, parts and training, according to Kemppainen. “We were constantly there supporting them with the rigs,” he said. He added that deep's managers were given the unique authority to order parts directly from the job site, which comes as no surprise considering the unforgiving schedule and critical need to keep the BAUER rigs drilling. Midtown Toronto is notorious for its troublesome ground conditions. This reality sunk in as deep began drilling ES-3. The first 10 m (33 ft.) included granular and silty sands. deep then hit the water table and encountered a flowing silt, which went down 16 m (52.5 ft.). A layer of dense glacial till stretched from 26 (85.3) to 32.5 m (106.6 ft.) below the surface. The contractor overcame the variety of soil conditions with careful drilling techniques and an assortment of drilling buckets and tooling. One challenge was unstable soil. deep relied primarily on BAUER drilling buckets to conquer the material. Augers were used as a back-up and bailers helped to remove water. deep's decision during the tender process to tap Ontario-based Isherwood Geostructural Engineers as a shoring engineer paid off. 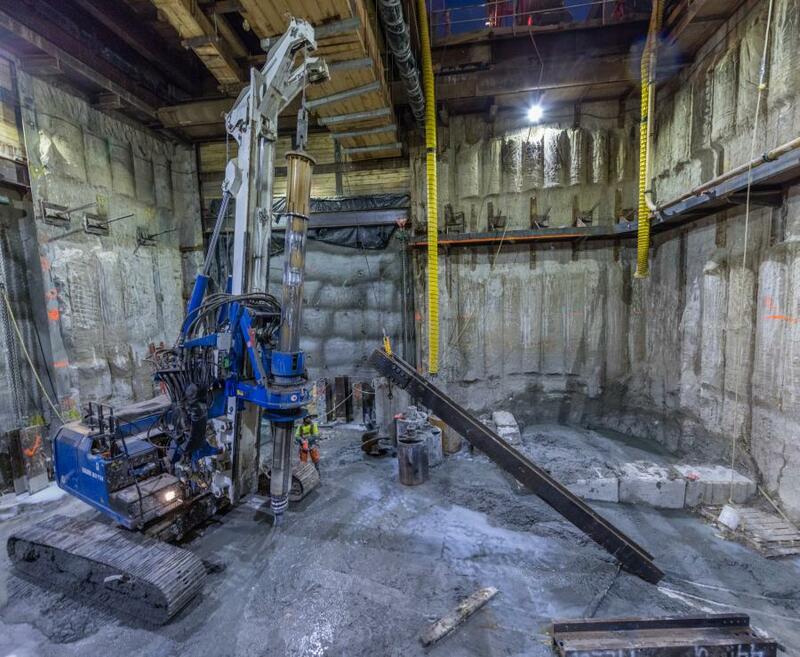 Working with deep, Isherwood engineered a creative solution whereby a shaft could be deepened just enough to allow the BAUER BG 11 to go below street level to install a secant wall from within. After establishing the dimensions of the rig and surveying the lowest utility supports, deep determined that lowering the grade to 15.5 m (50 ft.) and pouring a temporary slab would allow the BG 11 H to finish off the secant wall. deep built ES-3 in two sections: north and south. Each presented a unique set of challenges. The conflicting utilities in the northern half were relocatable, which allowed deep to build a secant pile wall by drilling from the surface with one of its five BAUER BG 40 drilling rigs. Fiberglass pile sections were used on the east wall to prepare for breakthrough by the TBMs. Once utilities were surveyed, located and protected with steel sheeting, deep relocated its BAUER BG 40 to commence drilling in the southern half. It was important to compare pile and utility locations to avoid any conflicts. The challenges with confined space and drilling depths faced in the northern half remained, but all holes were completed safely and efficiently. Supporting utilities was deep's top priority when excavating the southern half of ES-3. The crew built a lattice of steel support beams to support the utility ducts/conduits and mains running across the shaft before commencing work on the deck. Following a rigorous inspection, this deck was opened to traffic and the north deck was removed. The north would now remain open to allow for removal of spoils, and eventually, the two TBMs. 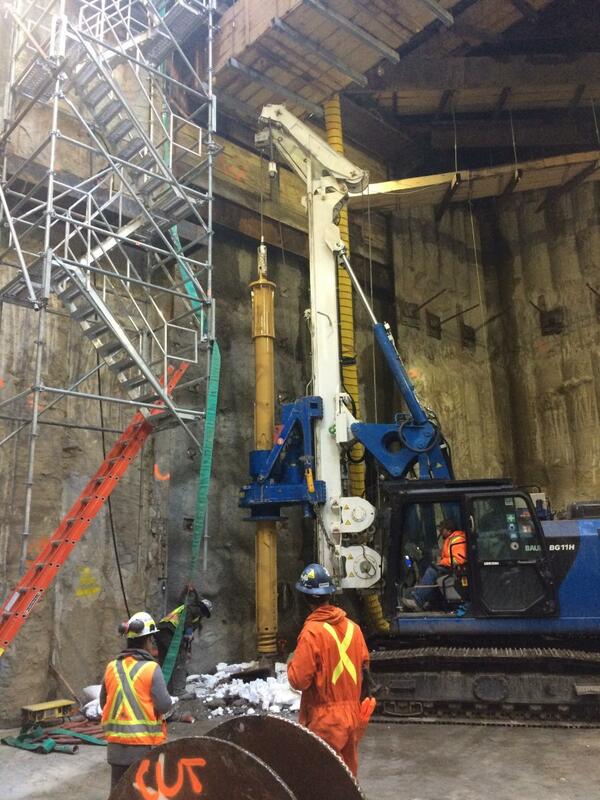 deep installed an internal waler and lagging design to continue shoring below the utilities so the slab could be poured for the BG 11 H. The system, designed by Isherwood Geostructural Engineers, allowed the excavation to be lowered enough for a compact air track drill to drive soil nails. The crew worked within a confined space to install the nails and spray shotcrete in a panel sequence to keep the ground stable as excavation continued. Alternating panels allowed deep to vertically excavate up to 1.2 m (4 ft.) of material every week. External dewatering was required for the final two levels because they were below the water table. Most secant piles were accomplished from street-level, but three windows remained in the southern half where that was not an option. Closing them during the remainder of the excavation proved to be the greatest challenge of the complex ES-3 shaft construction. The client dewatered ES-3 to lower the water table by one meter so the working platform could be poured at the correct elevation. The equipment ran until the secant wall was finished to keep the water at bay. One of the most interesting spectacles for passersby was the sight of a BAUER BG 11 H dangling from the end of a crane line as it slowly descended below street level. Drilling within the cavernous ES-3 was also one of the more complex engineering challenges deep overcame. The compact rig excelled at drilling in a confined space below unmovable utilities due to its lower header configuration, according to Kemppainen. deep was renting the rig from ECA at the time, but converted to a purchase because it was ideally suited for this operation. There were other selling points for the BG 11 H also. At 35,000 kg. (35 tons), it could be safely lowered into the excavation by a crane. The rig's ability to deliver 110 kNm (81,130-foot-pounds) of torque down to a depth of 40 m (131.2 ft.) was a bonus. Even though the BG 11 H was compact enough to work beneath the utilities, it was incapable of using casing to drill the remaining 17.8 m (58.4-ft.)-long-piles. deep needed a high-quality, water-tight secant wall to keep the shaft dry. The contractor harnessed more than 45 years of experience to develop a solution. deep chose a polymer drilling fluid to keep the holes open. 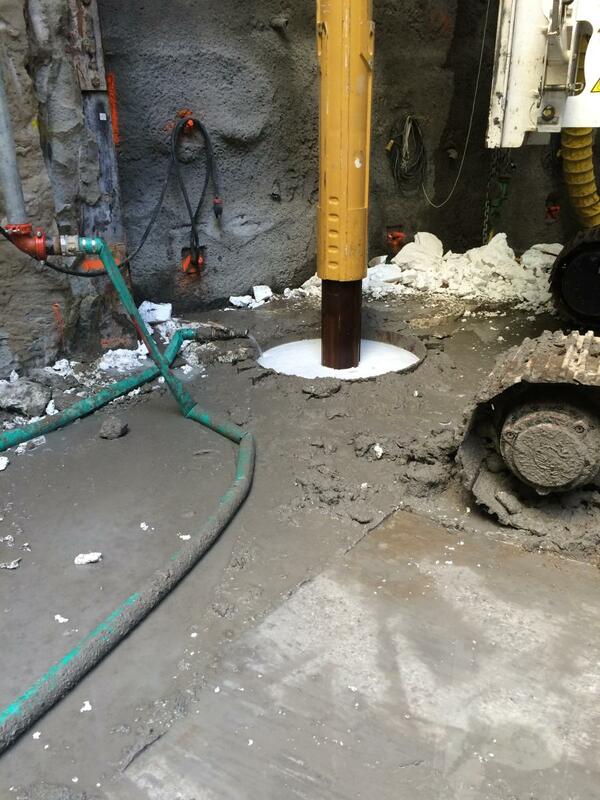 A liner was inserted to keep the top of the excavation open and the fluid was pumped for the remainder of the shaft. These steps, combined with dewatering, created enough head pressure to keep the flowing silt from caving in. The slurry bubbled in the tanks at street level while being mixed and agitated. deep regularly tested it for pH and viscosity before turning on the constant flow required during drilling. Perfection was mandatory. The size of the piles forced deep to improvise. At 18 m (59 ft.) in length and 8,400 kg. (18,400 lbs. ), they were too long to hoist in one piece and too heavy for the BG 11 H to lift. deep designed a hoisting device above each pile location that could lower each of the three six-meter sections to be bolted together before eventually being descended to their founding elevations. The hoist could lift three 6 m (19.7 ft.) sections together at a total weight of 8,400 kg. (18,400 lbs.). Once the piles were installed to the correct elevation the concrete needed to be placed. The concrete was placed under polymer slurry using the tremie method. The crew poured each pile with a flexible hose connected to a sectional tremie pipe fed by a pump that was positioned above the shaft. The pipe was then lowered to the bottom of each hole. As the concrete was placed, the slurry in each hole was displaced. deep scrutinized the volume and rate of concrete placement to guarantee that the piles were uniform and of high-quality. deep's crews persevered 24 hours a day, six days a week to complete the 29 secant piles under a rigorous schedule. By this time the northbound TBM had already broken through. The southbound TBM and a 50-person crew were crawling quickly toward ES-3. deep had to be out of the shaft before breakthrough. On March 13, 2017, the lower drilling came to a successful conclusion. Fiberglass crumbled and water spewed as the cutting head of the second TBM, known as Don, broke through the wall of ES-3. The project was completed successfully to the satisfaction of all parties involved. 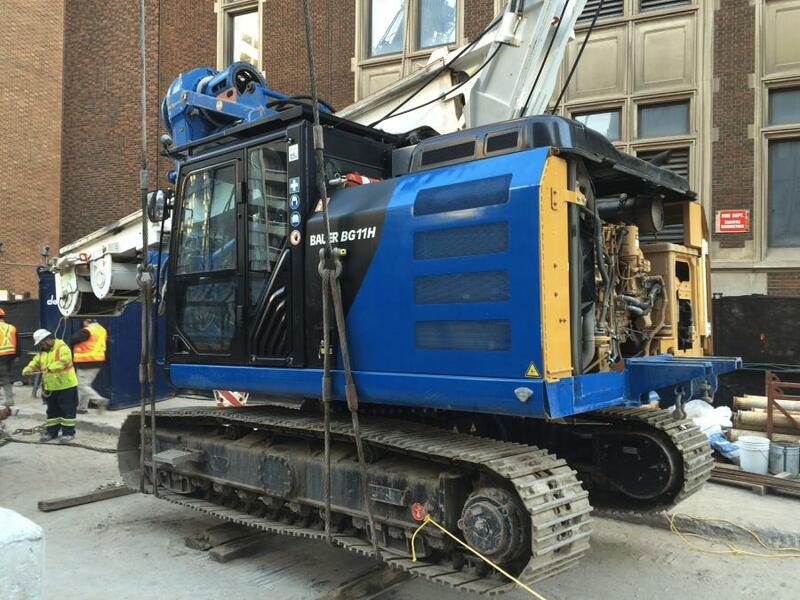 The close working relationship between deep and the general contractor Aecon/ACS Dragados JV, with some help from ECA and a fleet of BAUER Drilling Rigs, brought the city of Toronto about 3.5 km (2.2 mi.) closer to increased mobility.